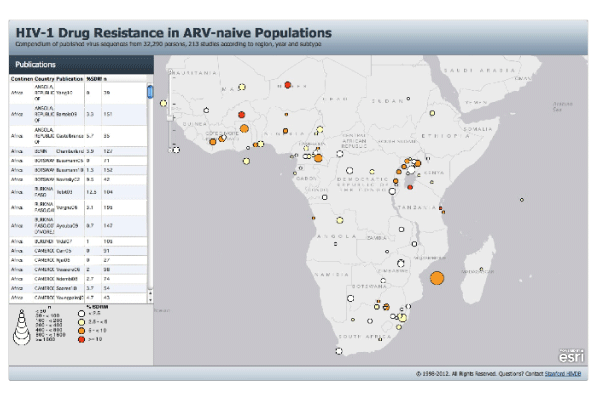 A new interactive Geographic Information System (GIS) displaying studies of HIV-1 Drug Resistance in ARV-Naive Populations has just been added to the ever-expanding HIV drug resistance monitoring tools developed by Stanford HIVDB group and their collaborators (Rhee et al. CROI 2012). The system uses published data to create snapshots of HIV transmitted drug resistance (TDR) levels across the globe. The data currently used is available through Genbank. The transmission of viruses already resistant to the antiretrovirals currently in use poses serious challenges to the management of these recent infections. These patients start ART with a compromised arsenal of ARVs. Therefore in resource-rich settings where TDR levels are higher, it is recommended that patients are genotyped before they can be initiated onto ART. This helps the physicians personalize the regimens based on the resistance profiles identified. However, this cannot be done in resource-limited settings, which have the greatest burdens of HIV. Therefore routine surveillance programs to monitor the levels of TDR at a population level to support the public health approach to ART have been recommended. A number of publications reporting on the prevalence to TDR in different settings have sequences that are made publicly available through Genbank. The GIS tool developed by the Stanford team generates spatial temporal data on the prevalence of TDR from studies published in different settings across the globe. The studies included had publicly available HIV-1 RT ± protease sequences from well-characterized representative populations of untreated HIV-1-infected individuals for which the country and year of virus isolation were available. Studies with epidemiologically linked patients were excluded as well as studies with study populations > 25 years of age. Currently the GIS tool is generating the prevalence from sequences from more that 30,000 treatment naïve patients published in more than 213 peer-reviewed articles. These studies have been published from both resource-rich and resource-limited settings. Each study included in the GIS tool is represented as a circle on the map. The size of the circle corresponds to the sample size and color to the prevalence of TDR. Data focusing on studies from Sub-Saharan Africa (SSA) and South East Asia (SEA) generated by the GIS tool was recently presented at the 19th CROI (03-08 March, 2012). 82 studies from Sub-Saharan Africa (SSA) and 39 from South / Southeast Asia (SSEA) met inclusion criteria. The 82 SSA studies included 9,179 individuals (median 71 per study). The SSA studies were most frequently conducted in South Africa (ZA; n=12), Cameroon (CM; n=7) and Uganda (UG; n=7). In 30 additional SSA countries, 1 to 3 studies were conducted. Eight studies included individuals from more than one country (Figure 1). The 39 SSEA studies included 3,189 individuals (median 57 per study). The 39 SSEA studies were conducted in China (CN; n=10), India (IN; n=10), Vietnam (VN; n=7), Thailand (TH; n=3), Cambodia (KH; n=2), and Malaysia (MY; n=2). Three studies were performed in countries of the former Soviet Union and two studies included individuals from more than one country. The most common HIV-1 subtypes in SSA were subtype C, followed by CRF02_AG, A, D, and several other CRFs and URFs. The most common subtypes in SSEA were CRF01_AE, followed by subtype C, subtype B, and two B/C CRFs (CRF_07 and CRF_08), and B/01 recombinants. Prevalence of genotypic resistance: The median proportion of individuals per study having > 1 SDRMs was 3.2% for SSA (IQR: 1.1% to 5.7%) and 2.4% for SSEA (IQR: 0.6% to 6.1%). In both SSA and SSEA, the prevalence of NNRTI SDRM increased with year of virus sampling (OR=1.003; p<0.001 for both regions). In SSA, but not in SEA, the prevalence of NRTI SDRM increased with year of virus sampling (OR=1.003; p=0.005). There were no temporal trends in the prevalence of PI SDRM in either region . The collation and analysis of data collected over time and from various geographic settings provides more insight on the impact of the increased access to ART on the patterns and levels of TDR than the analysis of individual studies. Although there is an overall upward trend in the levels of TDR in both SSA and SEA, TDR levels are still low, <5%. This analysis also confirms recently published data from South Africa that also showed that TDR levels in South are still less than 5%. However, there is need for more vigilance in monitoring TDR especially in SSA as there are some individual studies that have shown levels TDR surpassing the 5% threshold. In addition, the numbers of patients on ART have been increasing exponentially during the past ten years necessitating closer monitoring of the ART programmes. 3. Manasa J, Katzenstein D, Cassol S, Newell M.L, de Oliveira T. Primary drug resistance in South Africa - data from 10 years of surveys. AIDS Research and Human Retroviruses. Online ahead of print. doi:10.1089/AID.2011.0284.